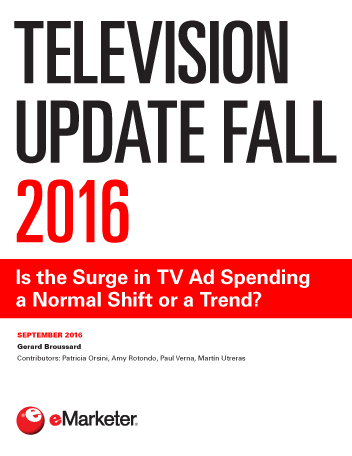 Television Update Fall 2016: Is the Surge in TV Ad Spending a Normal Shift or a Trend? The recent upswing in TV ad spending likely signifies a normal spend fluctuation buoyed by an increase in total ad expenditures, rather than a mass return to the first screen by advertisers. But time and improved TV-digital attribution measurement will help settle the matter for certain. TV ad spending in the US experienced a surge in Q4 2015 and Q1 2016, which was followed by a 4.5% increase in 2016–2017 primetime TV upfront ad sales vs. 2015–2016. Key advertiser categories driving growth included automotive and pharmaceuticals, sparked by new car models and drug brand introductions. Online gaming, airline and hotel travel TV dollars were also up sharply. The recent lift in all media ad spending is the most likely driver of the TV surge. Digital ad volume, for example, has also risen swiftly. An alternative view is that advertisers are returning to TV for accountability, concerned about digital’s issues with ad blocking, ad viewability and limited digital video audience scale. However, this scenario needs to play out over a longer time span to be proven. TV and digital are in a dead heat for US media dollars, and the scaling of digital video will be critical for digital’s continued advertising success. "eMarketer expects digital ad spending will make up 36.8% of total media ad spending in the US this year, edging out TV’s 36.4% share. But the recent surge in TV ad spend may be a sign that more money is destined for the first screen." A Short-Term Surge or a Return to Safe Harbors?